Joseph had a dream of leading his family, but he became an Egyptian slave. Moses thought he could rescue his people from slavery, but he became a fugitive from the law. Daniel hoped to be a witness for God in the Babylonian court, but he became the menu for a group of lions. All three men eventually realized their purposes, but only after going through a dark tunnel wondering where the Engineer of their lives was taking them. God could make our paths smooth and easy, but He rarely does. And He has good reasons for everything He does (Jeremiah 29:11). Thinking God will make life easy and understandable is perhaps the greatest hindrance to our faith (Hebrews 11:1). 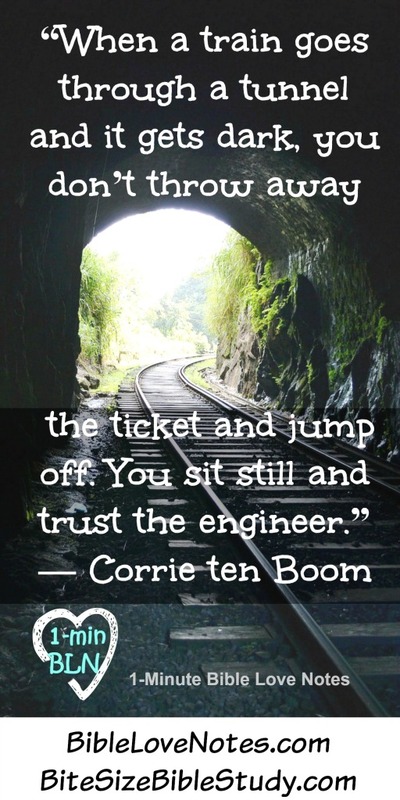 Are you in a tunnel right now? 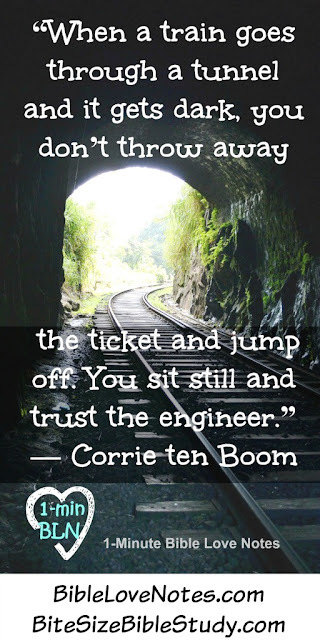 Sit still and trust the Engineer (Proverbs 3:5-6). 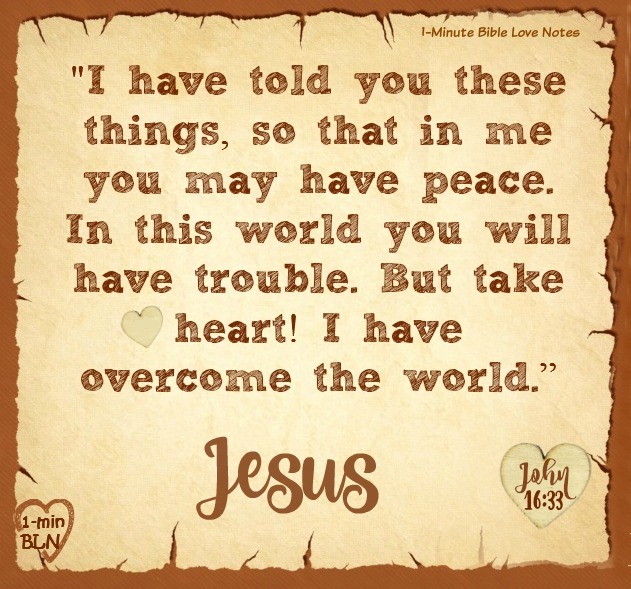 Would you like a 1-minute devotion like this delivered to your inbox each weekday? Sign up for a free subscription at BibleLoveNotes.com. If you'd like a short Bible study each Monday, sign up for a free subscription on the right side bar here. It's not biblical to think life should be easy. The following Scriptures are worth studying. Acts 14:21-22: "They preached the gospel in that city and won a large number of disciples. Then they returned to Lystra, Iconium and Antioch, 22 strengthening the disciples and encouraging them to remain true to the faith. 'We must go through many hardships to enter the kingdom of God,' they said." 1 Peter 1:3-10: "Praise be to the God and Father of our Lord Jesus Christ! In his great mercy he has given us new birth into a living hope through the resurrection of Jesus Christ from the dead, 4 and into an inheritance that can never perish, spoil or fade. This inheritance is kept in heaven for you, 5 who through faith are shielded by God’s power until the coming of the salvation that is ready to be revealed in the last time. 6 In all this you greatly rejoice, though now for a little while you may have had to suffer grief in all kinds of trials. 7 These have come so that the proven genuineness of your faith—of greater worth than gold, which perishes even though refined by fire—may result in praise, glory and honor when Jesus Christ is revealed. 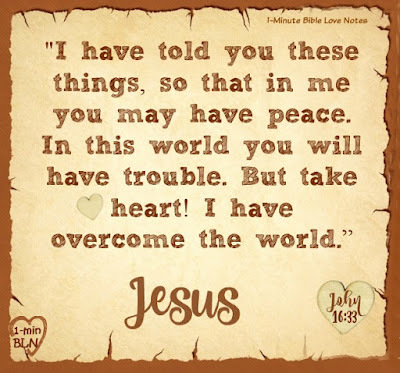 8 Though you have not seen him, you love him; and even though you do not see him now, you believe in him and are filled with an inexpressible and glorious joy, 9 for you are receiving the end result of your faith, the salvation of your souls."